; Wah Dih Story Seh? : An oral tradition in the Guyanese village of Buxton (GloBUNTU Books) – Guyanese Girls Rock! Do you tell and (re) tell stories you grew up hearing? Do your children tune you out when you tell those “ole time stories”? Do they ask more questions than you can answer, especially if you live in the diaspora?? If this is your story, this book is for you. 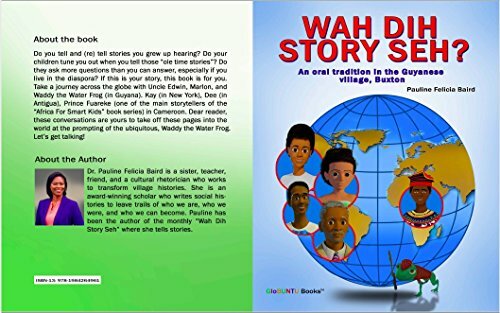 Take a journey across the globe with Uncle Edwin, Marlon, and Waddy the Water Frog (in Guyana). Kay (in New York), Dee (in Antigua), Prince Fuareke (one of the main storytellers from the “Africa For Smart Kids” book series) in in Cameroon. Dear reader, these conversations are yours to take off these pages into the world at the prompting of the ubiquitous, Waddy the Water Frog. Let’s get talking!